× 2 = 4 Required Please enter the correct value. The cannabis legalization movement is an unstoppable force in North America, leading to $10 billion in sales in 2017 alone. And in 2019, we're going to see a wave of marijuana mergers and acquisitions that will unleash a new wave of wealth for investors. Remember what I've said about M&A activity. The corporate mantra these days is: If you can't beat them… buy them. And if you can't grow a business yourself, it's best to buy someone else's firm. In recent years, established tobacco and spirits companies weren't willing to throw millions of dollars into cannabis production and distribution until they were sure marijuana legalization was more than just a trend. Now, they're spending billions to get their share. In October 2017, Corona maker Constellation Brands Inc. (NYSE: STZ) purchased a stake in Canopy Growth Corp. (NYSE: CGC) for $191 million. Then in August 2018, Constellation really upped the ante with an additional $4 billion investment. Next, on Dec. 7, 2018, cigarette giant Altria Group Inc. (NYSE: MO) bought 45% of Cronos Group Inc. (NASDAQ: CRON) for $2.4 billion. Over the last 12 months, the Canopy Growth stock price climbed 8.57%, and the Cronos Group stock price has done even better, climbing 48.90%. Considering the Dow Jones Industrial Average is down 9.5% during that same time, that's impressive. That's just the tip of the iceberg too. Going into 2019, Greg Miller, Executive Director of the National Institute for Cannabis Investors (NICI), says we're going to continue to see an "exponential increase" in merger activity. And when it comes to identifying the power players in the year ahead, I'll say Greg knows the sector better than anyone I've ever met. After our recent conversation, I started to think which companies might be flying under the radar. A lot of investor attention is centered on the cannabis producers and the products that cycle through the supply chain. But what about the ancillary companies? I'm talking about the firms that provide critical services to the industry. Without these services, the cannabis industry can't reach its potential $75 billion value in the next 12 years. That's why I've been looking for a little-known company that has a robust customer base, undervalued assets, a remarkable growth thesis, and enough exposure to the growing cannabis sector that its stock can surge thanks to many different revenue streams. I'm talking a stock that could surge triple digits in the year ahead. With cannabis now a mainstream investment, there's one area of the market that too many people are ignoring. That is the financial sector. Long before Altria and Constellation made their bets on cannabis, one investment banking firm pushed its chips across the table early. Manhattan-based Cowen Inc. (NASDAQ: COWN) was the first major investment bank to assign an analyst to cover cannabis stocks, and it began to offer advisory services to the Canadian cannabis sector. 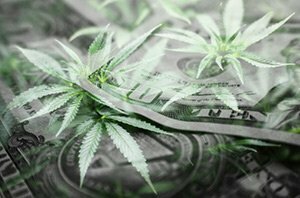 The banker hosts an institutional cannabis summit that has drawn significant attention across the banking space. Cowen is also tied as one of the leading advisors on initial public offerings in the cannabis space, according to Deallogic.com. Cowen helped bring Tilray Inc. (NASDAQ: TLRY) public, which was the single most important cannabis IPO in the industry's short history. We don't know exactly how much, but Cowen made a big chunk of change from fees and its stake in the firm as well. An underwriter fee can be 4% to 7% of the gross proceeds of an IPO, according to PWC.com. Tilray raised $153 million in its initial public offering, so Cowen could have netted as much as $10 million for its services. Also, the firm was behind a convertible bond offering for Canopy Growth. As mergers and acquisitions continue, I anticipate that they will be the leading U.S.-based M&A advisory in the marijuana industry. And as regulatory changes evolve, Cowen will have the legal knowledge and know-how in place to become an advisor of choice for U.S. cannabis companies. Also, its presence in Canada offers a first-mover advantage in cross-border operations, which is vital for large U.S. companies engaging in these projects with Canadian producers. Of course, Cowen isn't just a cannabis bank. It's also a top shop in the biotech space, helping fund some of the market's top activist investors to unlock gains for shareholders across multiple sectors. Cowen also makes money through healthcare royalty streams, merger arbitrage strategies, private equity, and real estate plays. So, this wouldn't be an all-in play on cannabis for a larger financial institution looking to snap it up. But let's get to the real value here. The windfall this broker-dealer will reap because of its early adoption will make it an incredible bargain for larger financial institutions that choose to buy access to the market. These big firms would rather buy a turnkey operation instead of building the industry knowledge themselves. It turns out, they don't need to pay much for the right to do so. Cowen Inc. is criminally inexpensive. It trades at a ridiculous 0.9 price-to-tangible-book value, which means you're paying $0.90 on the dollar to buy into this company. Keep in mind, this doesn't even begin to account for the tidal wave of cannabis IPOs that are headed our way in 2019. Cowen should once again have a hand in many deals during the next 12 months, and that could lead to a triple-digit profit opportunity. 2019 is gearing up to see a record number of high-flying cannabis IPOs hit the market, each capable of unleashing millions of dollars into the market. It's a true investing phenomenon. Right now, there's a real chance to get in on a once-in-a-lifetime IPO one… two… even three times a MONTH for the next year. All you have to do is click here to learn how you can profit from the world's most exciting investment opportunity.